Sa'da reveals a major discovery. Sabaean script is much older than anyone thought. Long ago, nomadic tribes gathered in the desert oasis that is now the beautiful Yemeni town of Sa'da. Surrounded by hot sands and devoid of harmful humidity, Sa'da is the perfect location to preserve some of the oldest petroglyphs and rock art from Yemen's great past. ViewZone's crew was anticipating a brief rest from the road prior to our scheduled return to Yemen's capital, Sana'a. 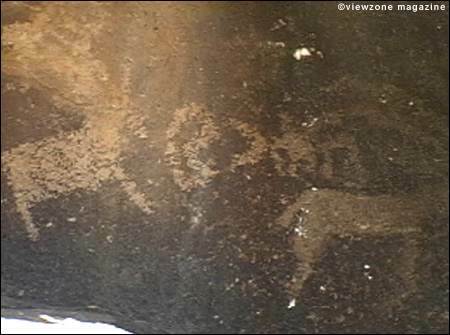 We were approached by our guide, Ahmed, who said that he has heard of some very old petroglyphs in a remote canyon. We were especially anxious to see these carvings because Ahmed had also been told that there was writing in an "unknown language" that accompanied the glyphs. The drive was hot and lengthy but we entered a narrow canyon with very old stone. The face of this cliff was black with patina, a natural coloring process which darkens stone over millennia. Inside the canyon there was a small group of tents and camels, the temporary homestead of a Bedouin family. We immediately approached them and offered our greeting. We noticed that the Bedouins had pitched their tents near a wall of the canyon that had been chalked to reveal the shapes of the ancient carvings. One of the Bedouins had done this. The panel was about 22 feet across and showed a display of several rams with large curved horns, flanking a reclining human like figure. The figures were originally pecked, indicating that they were likely made during a period when iron tools were nonexistent. Similar pecked rams in other locations around the world have been dated to more than 4500 years old. This was a nice find, but not the writing we were hoping to find. "Mister Gary! Over here!" Nassar had been strolling along the canyon and saw a collection of familiar designs, pecked into the rock yet covered by dark patina. 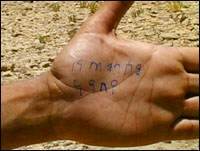 He hurriedly scribbled the characters on his hand with a ball-point pen. Was this a joke? We scrambled to view his find. Our eyes caught the familiar "Mem" and "Resh" as we approached the wall. It was what we had hoped to find -- Sabaean texts from the older era! Further down the canyon there was more writing. 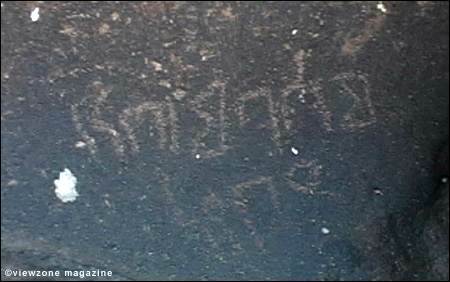 Our hearts stopped when we saw the collection of Sabaean letters arranged in a petroglyph with several of the ancient rams. This was now more than we had ever hoped to discover. We had, in one single petroglyph, found evidence of these two concurrent styles, confirming the antiquity of the Sabaean alphabet. The crew went crazy photographing the area and taking GPS readings. Many of the pertoglyphs would later be translated using enhancing techniques and the proto-Canaanite translator. We returned to Sa'da a happy bunch. We were now determined to return to Yemen, and to Sa'da especially, and to continue exploring this unique canyon. But it was time to return to Sa'da and to see the old walled city.